How much power are you willing to give your government? It’s obvious that not all of us are in agreement with legislation proposed by our President and the Democratic lawmakers. After seeing how they work, we have ample reason to worry about what will be next. Health care is only one of several bills that are being pushed though the system without proper review. Howard Dean, former chairman of the Democratic National Committee, in a recent MSNBC interview with Keith Olbermann bragged that more was coming. The question of how much is too much becomes a genuine concern. After being witness to just a glimpse of what Obama and his party are doing, I had hoped for more resistance to their plans. Even as Obama reveals more of this dark side of what’s in store, we still have people who continue to cling to the notion that in the end it will be alright. Never mind the constant barrage of the President’s week-day television appearances, which target a different perceived foe each day. A constant flow of class warfare rhetoric endeavors to pit rich against poor. As always, the middle class is caught between the other two. We are being pushed to the left and into socialism. It appears that Obama intends to have everything placed under tight government control. As you should recall, our nation is the result of people rebelling against such control. There is more than one example in history where such control has lead to nothing short of eventual misery for the people trapped in it. In spite of all the flaws in our system we are still a better country than any other, a fact underscored by the number of immigrants, legal and illegal, in this country. If we are forced to oppose the President and his party, how do we do it? Turning the other cheek will only result in getting it slapped as well. Contrary to what has been said, rowdy behavior at public meetings works. It gets the attention of our elected officials and encourages other people to speak up. A squeaky wheel gets the grease. 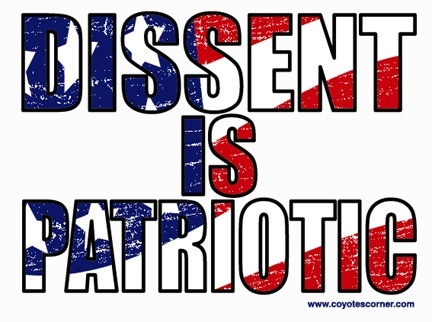 Dissent has been a liberal tool for years, and will work just as well for the rest of us. I will go so far as to say that the longer we wait to speak up the worse it will get. Fair play and complete honesty don’t live here anymore. Maybe it’s about time for us to act accordingly. Are you committed to freedom enough to speak out in its behalf? Are you ready to start pushing back? Larry, dissent is fine, speaking up is fine, even being a little rowdy and making some noise is OK. But it’s important to avoid looking ignorant in the process. Talk of “death panels,” comparing Obama and Democrats to Nazis, idiot gun freaks showing up with weapons at town hall meetings — all that just reinforces the erroneous image that all those in opposition are ill-informed rednecks.